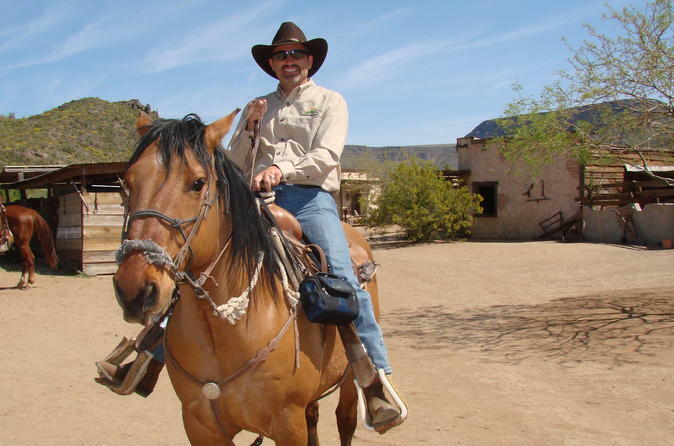 Go on a horseback riding adventure with some real cowboys!! You'll go back in time to the 1800s on this trail ride that takes you into the incredible hills and cactus filled deserts around Phoenix and North Scottsdale. You can customize this day with a one or two hour trail ride. Depending on your ride time (morning or afternoon), enjoy a Cowboy style lunch with western themed games and activities just before or after the ride. The lunch includes a hamburger, hot dog or grilled chicken, beans, corn on the cob, chips, dessert and unlimited soft drinks. Then have an amazing time with the western activities....learn how to shoot an arrow.... throw an axe... and try your hand at roping a steel calf. It's all in a day's work on the ranch! This tour also includes a visit to Cave Creek, Arizona for some western style antique shops and saloons. Enjoy a guided tour of the area as you make your way to the corral where the adventure begins. The Wranglers will take you on your choice of a 1 or 2 hour trail ride with amazing Sonoran Desert views and plenty of cactus.... but look, don't touch! Depending on your choice of morning or afternoon ride, you will enjoy a wonderful Cowboy style lunch, included in your tour. During the warmer months, the riding is done in the morning, while for a few months of the year, you could choose either morning or afternoon. You will also have a blast taking on the western activities. Rope a steel calf, shoot a bow and arrow, and throw an Apache axe. You will learn from the best wranglers in the West! After the horseback riding and western adventure, you'll head for the antique shops, western village and saloons of Cave Creek for some relaxation time. It's a taste of all things Arizona for all ages. Tour includes ground transportation, horseback ride, western activities, lunch and soft drinks.